Top 100 questions: Have Ravens underachieved? Published: June 20, 2012 at 12:40 p.m. 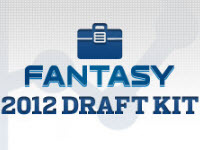 Updated: Aug. 17, 2012 at 06:51 p.m.
We only have 20 players left to reveal in the "Top 100: Players of 2012." With Nos. 20-11 set to be revealed Wednesday night, we have a few burning questions to ask. Four Baltimore Ravens remain on the list. You don't have to be a genius to figure out they all play defense. With Ray Rice also cracking the top-30, it makes you wonder: Have the Ravens underachieved over the last few years? They have a ton of elite talent and yet they haven't broken through to get to the Super Bowl. Then again, perhaps Ray Lewis and Ed Reed shouldn't be ranked so high. When will the next quarterback show up? Ben Roethlisberger was ranked way too low at No. 30. Only three quarterbacks rank ahead of him. We would think that Aaron Rodgers, Tom Brady, and Drew Brees could all crack the top-10. But there's a chance that one of them gets slighted tonight. Who is the highest-ranked defensive player? Darrelle Revis could make a strong case. Jared Allen, DeMarcus Ware, and Terrell Suggs also make sense of players not yet on the list. We'd vote for Revis. But no one gave us a ballot. Larry Fitzgerald, Andre Johnson or Calvin Johnson? You would think that Andre Johnson would not be the top wide receiver after an injury-plagued year. (Then again, you wouldn't think John Kuhn would make the list.) It should come down to Calvin Johnson or Larry Fitzgerald. We'd still vote for the "old" guard (Fitzgerald) for his all-around game.